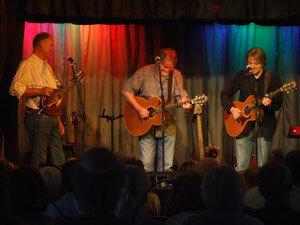 Mick Adrian, Ian and Graham play guitars, mandolin, mandocello, bouzouki and banjo as well as harmonica and melodeon - almost entirely acoustic, but with some subtle electric guitar and bass touches. Most of all they sing - finding unexpected harmonies in a mix of old and recent songs from both sides of the Atlantic, some written by themselves, others by their heroes like Woody Guthrie, Richard Thompson, Hank Williams, John Martyn, Bob Dylan, Guy Clark, Robert Johnson, Buddy Holly, Tom Waits and good old Trad Arr.You'll hear songs to join in with, songs to make you think, songs to move you and songs to get you moving. When Adrian turns up the volume on his electric guitar and with the addition of Ian Southerton's bass guitar they can also turn their hands to a lively rock n roll set if the need arises or the mood takes them. All four also play in the acoustic rock and roll band Root Chords.